This is Ayumu, he's an 11-year-old chimpanzee who lives and trains at Kyoto University's Primate Research Institute. In his time there, Ayumu has come to excel at an incredibly difficult — albeit very straightforward — memorization game. If you challenge him to this game, you will lose. Allow me to be perfectly clear: there is absolutely zero chance of you besting Ayumu; he will positively destroy you, and he will do it with ease. But how does he do it? There's a good chance you've heard of Ayumu before. 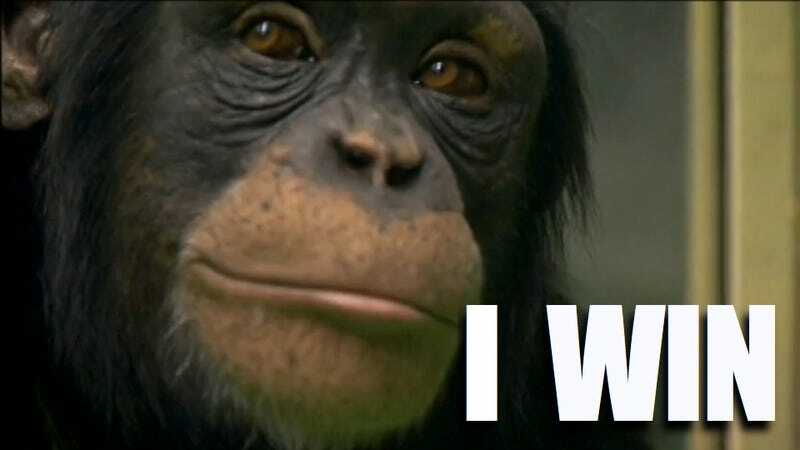 Back in 2007, the media ran wild with news of his incredible feats of memory, with headlines like "are you smarter than a chimp?" For those of you unfamiliar with his abilities, this video demonstrates Ayumu doing what he does best: a straightforward working-memory challenge. Cognitive psychologists use the term "working memory" to describe the mind's ability to temporarily store and manipulate information. In this case, that information is the position of arabic numerals on a touch-sensitive screen. Ayumu is shown the numbers 1—9 on the computer screen, and given just a fraction of a second to commit their randomized location to memory. Once that fraction of a second is up, the numbers are covered with white squares, at which point Ayumu must select them in numerical order. What makes this feat especially impressive is how little time Ayumu is allotted to commit the numbers' positions to memory before they are covered by the squares. This length of time can be varied by the researchers who study Ayumu; generally speaking, shorter time allotments translate to poorer task performance. This figure helps demonstrate what we're talking about, and will give you an idea of how your typical college student stacks up against Ayumi. This chart is from the first research paper to describe Ayumu's abilities, published back in 2007 in the journal Current Biology; it reveals how Ayumu performed on the memory task compared to his mother (a chimp named Ai), as well as nine similarly trained university students. Notice how the percentage of successfully completed tasks declines as you move from left to right. This is the result of decreasing the span of time between when the numbers appear on the screen and when they are covered up. The chart shows the test subjects' performances when allotted 650 milliseconds, 430 milliseconds, and finally just 210 milliseconds. Ayumu not only outperformed all the other test subjects, his performance remained more or less consistent for all three time durations. But there's something you should know about these results. In this experiment, Ayumu, his mother, and the university students were only asked to recall the position of five numerals. Before we go any further, go try this online flash game that replicates the original study. I managed to score nine out of ten after a couple tries, so I'm not certain how accurately this game reproduces the original testing conditions (for example, I have no idea how many milliseconds this game gives you before hiding the numbers), but it is sufficiently challenging to illustrate the point I'm about to make, which is that in the video up above (which was filmed just last year), Ayumu is clearly keeping track of not five, but nine numbers. And here's what's most impressive of all: he's committing those numbers to memory in just 60 milliseconds — that's less time than it takes you to blink, let alone scan a grouping of numerals and commit it to memory. Since 2007, Ayumu's working memory abilities have gone from impressive to utterly, mind-bogglingly ridiculous. So how the hell does he do it? There are a couple of ideas. The first points to a poorly understood (and poorly defined), controversial phenomenon known as "eidetic imagery," which is characterized by the ability to commit to memory an accurate image of a complex scene or pattern. Some researchers, most notably psychologist Ralph Norman Haber, believe eidetic imagery may occur in as many as 15 percent of children under 12, but that the ability fades over time, and only rarely presents itself in adults. In the 2007 study examining Ayumu's task performance, lead researcher Tetsuro Matsuzawa claims that Ayumu's working memory capabilities — which were superior to those of adult humans as well as an adult chimp — fit well with what is known about eidetic imagery abilities in humans. The other explanation boils down to a skill known as subitizing. Subitizing is the ability to glimpse a small number of items and instantly know how many are present. For example, you can immediately recognize that there are three blue stars in this image. This skill is very different from "enumerating," whereby you determine how many items there are by counting them individually. Generally speaking, humans are capable of subitizing groupings of about four or five items; any more and we fall back on enumerating. The common ancestor of humans and chimpanzees may have possessed an extraordinary memory capability, much like that exhibited by Ayumu. At a certain point in evolution, because of limitations on brain capacity, the human brain may have acquired new functions in parallel with losing others — such as acquiring language while losing the visuospatial temporal storage ability demonstrated [by Ayumu].